Do you have a story to share? Are you interested in creating a business that gives you the time and space to create a life? If you want to start a blog, or if you recently started blogging and feel a little lost, know that you are not alone. You could spend the next 5 years researching the best way to start and grow a blog and barely scratch the surface of the available information. The problem with all of that research? You are so focused on getting ready and you are never getting started. No more waiting for the perfect time, the best idea, for inspiration to strike, or for fear to disappear. This is a meaningful adventure for you and the people you will serve when you start your blog. Before I started blogging, I wanted my blog to help me quit my job, work less, travel more, work with great people, be an artist and create, be healthier and happier, and to encourage and connect with people who wanted to simplify their lives. All of these desires helped me to start my blog with purpose and that purpose gave me great clarity, direction and the conviction to keep going even when I had no idea what I was doing. Think about and identify what you’d like your blog to do for you and others. That purpose will make all the difference. If you are worried about any of the following, you are not alone. I’ve been there, and helped hundreds of clients overcome these concerns. I created this microcourse to help you too. One easy to open PDF with more than 12,500 words,an inspiring playlist, audio lessons and a recorded webinar. There is so much to learn about blogging, but you don’t need to know everything to get started. You might not want to do all of these things, but they are available to you. The course lessons are simple, direct, and include what I consider to be the most important information for getting started. While you can take as long as you want, you can purchase this course today and launch your new blog tomorrow, or next week using the information provided. A microcourse is always less than $20.00. I made that promise to you and I’m keeping it. I believe that doing work you love should be accessible to anyone that is interested. I hope this affordable pricing helps more people start a blog in an easy to understand, enjoyable, powerful way. This course is not available anymore. 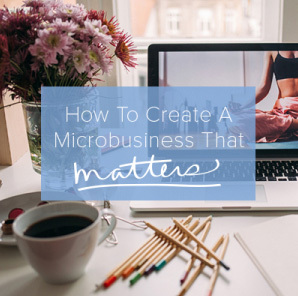 Please check out How to Create a Microbusiness that Matters. I’ve had a blog for years. It spends a lot of time in a dormant state. I get bursts of creativity and productivity followed by long quiet times when other commitments take priority. I have not really broken or beyond a friends and family readership. I’m buying your course today to find out what you have to say about building a subscriber base and to learn about planning and frequency of posting. I enjoy your writing and always find something valuable to take away. Thanks for sharing your knowledge and ideas. I’ve just entered my 4th month of blogging and I’m a little tempted to get started on this course. I’d like to make money from my blog eventually, though that is far off from my plan for now. Currently I’m just hoping to have a few hundred FB fans, and at least 100 subscribers by 1 year. Some $$$ would be nice. I’m wondering if this would be suitable for me? Jeremy, I think it will be really helpful. I will get started on it in a few weeks’ time and will let you know how it goes. Thanks for sharing I just signed up for your course. It is one of my goals for 2014 to start a blog — here goes. Thanks Judi! Let me know how I can help. I am not a blogger and have no interest in starting one. I do enjoy reading them though. One thing I would like to suggest to bloggers is to carefully edit each entry. I see so many spelling errors, words left out of sentences, etc. I find it very difficult to continue reading a blog that has too many errors. Just as an example, the second line of this blog post has the word “has” missing from the second line. So, careful editing should be a must. I can relate, haha. I don’t mind it once in a while, but I know bloggers who have several errors in every blog post. It can be a put off. If typos really get you down, it’s always helpful to privately email a blogger and let them know. We really appreciate it! Thanks Kathy, Made the change. I am really excited about this course! I have a basic blog that could use some direction, and I have been stuck for a while now. 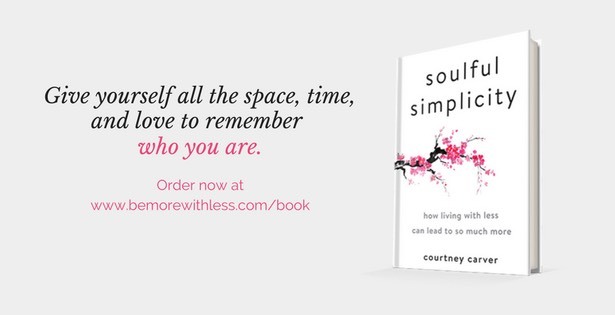 I think that this course will help me just like the content of Be More with Less has helped me. Thank you Courtney! Thanks Sara, Can’t wait to hear about your experience with the course. I already have a blog, written in Spanish. But I’m feeling adventurous and I started a blog written in English yesterday! Your micro course came in the best moment. It’s interesting that this popped up for me today. Figuring out what I want to do with my blog, which direction I want to head is one of the intentions that I set for myself for the month of March. I’ve been blogging off and on, with my own domain and on various platforms, for a little over 10 years. My readership is small (generally my mom, my mother-in-law, my best friends), and I’m trying to decide if I want or need more than that or if I’ve got something that I want to share with even more folks…and if so, how do I go about reaching that audience. Thanks to your microbusiness course I started my blog. But I love the topics offered in this course. Courtney, you have the heart of a teacher. You are very inspiring, informative and practical. I also love the affordable price. I’m registering and look forward to begin. Thank you! Awesome Kelvin, Let me know how I can help. I’m going to sign up for this course, because I like Courtney’s topics and always find some useful or interesting content in each of her blog posts, and because I am getting ready to launch a webpage for my new solo law practice and would like to have a blog page on that website. However, like Kathy, who commented above, I am frustrated by the frequency of grammatical, spelling, or punctuation errors, as well missing or “bonus” words, in posts I read from various bloggers. Such errors are especially distracting when they are made by someone who is marketing his or her writing skills! An example from this post, to add to Kathy’s comment, above, is this: “While you can take as long as you want, you can purchase this course today and launch your new blog tomorrow, or next week based using the information provided.” The word “based” can be omitted. I suspect it’s a remnant from an earlier draft that managed to slip by during the final editing. By the way, if anyone reading this reply has a blog and would like a complimentary proof-reading of one blog post before publishing, I offer my services! I’m also available, for a modest fee, as a contract proof-reader for any on-going projects that might benefit from such services. In any event, I’m sure this course will be an invaluable resource for anyone wanting to get her creative juices flowing or his ideas on the page and out into the wider world! Thanks for the great value, Courtney! Allison, I appreciate your thoughtful feedback. I made the change you recommended. Typos are part of this work. I always advise new bloggers to use spell check and proof their work, but not to let the fear of a misplaced word or comma prevent them from publishing. A strong story isn’t diminished by a typo and fortunately, typos can be easily corrected on a blog. I always appreciate when someone takes the time to email and let me know that I need to correct something. Thanks for taking the course. I hope you find some valuable information to help with your new site. Just purchased this and I’m so excited to dive into it. I think this is just the push I needed to jump into the business of blogging. Thank you, thank you, thank you. Hi. Just wanted to chime in on the blogging. I have a travel blog that really enhances my experiences on the road. It’s an opportunity to 1) reflect and 2) share with others. Plus, I figure I’ll have some good reading when I’m in the nursing home! My DH and I are also very much into minimalism and living the simple life. Love your blog and I’m hoping others find their way here through the link on mine. I’m in! Thank you for putting this together. I can’t wait to get started! I love your course content. I have started a blog over an year ago but just feel stuck and not sure how to grow my subscriber list or earn first 100$. I have been reading your blog for sometime now and looking forward to do this course. Just have one quick question, will there be any forum or FB group of all the people who are taking this course? I was one of those people who wanted to start but just never got to it. One day I just couldn’t take it anymore I decided I was going to start regardless of how people viewed me. Now I can’t imagine my life without blogging and hope one day I’ll be able to make a living with it in the future. For right now I’m just having fun!! Bought it. I’ve wanted to create a simplicity blog for a long time. This will give me the kick up the bum I need. Thank you! Thank you! I ordered the course last night and this was perfect timing. I previously had a blog spot blog that I only sporadically used. Just this week set up a new blog, but have not yet finished. This course will be just what I needed. I have followed you blog for several years and have a couple of your e books already. This microcourse couldnt have have come at a better time! Thanks Courtney, really looking forward to doing the course and finally publishing my blog. Thank you for your encouragement and inspiration. Just purchased the course and am excited to get started! I will be starting from scratch, and I look forward to the experience since I love to write! Thanks for offering this course at such an affordable price! I started my blog around 11 months ago. I have achieved 43000 views in that time, which to me was pretty astounding. I’m not thinking I want to monetise it; but who knows? Is it really worth it? I think I have 50 subscribers right now. Been a reader of your writing for a year or more and I was thinking to build my own blog and came across this micro-course. I’m a reader from Iran and planning to write in Farsi this time. I am interested in both this course and the “Micro Business” course. I am a total beginner in regards to blogging. Which one should I invest on? It’s not the money that is the problem since both courses are both very reasonably priced, but rather the time. Nick, If you are ready to start a blog, I’d start with the blogging course. If you are looking for a bigger picture course, try the microbusiness course. Feel free to email me too with any questions. Courtney, I think you handle criticism about little typos and mistakes with such grace and class. Thank you for sharing your heart, knowledge and story with us. And by the way, I see some errors in Allison’s comment above, so there you go!! Ugh! Kathy’s comment prompted me to reread my previous comments above. What was I thinking?! How embarrassing! Sorry I was overcritical of your occasional errors, Courtney. I hope you focused on my other message, which was that I appreciate all the helpful and thoughtful content you publish on a regular basis. When you publish that much, there are bound to be insignificant errors once in awhile! Please accept my apology, Courtney. Thanks, Kathy, for prompting me to revisit my post. By the way, I welcome constructive criticism, so please do let me know what errors you noticed in my comments, since you mentioned seeing some. Thanks. I just got the course. Have been a long time since I’m thinking about start a blog, years maybe, but I never did. I think your post in my wall on FB open my eyes and gave me courage to start. I have to confess I’m a bit scared, and I really don’t know what I could expect, but I’ll start. I hope your course will give me the support and strength I need. Many thanks for sharing your experience, Susana. I just purchased the blog course and I recently purchased the micro business course via a blog post by Tammy Stroebel (Rowdy Kittens). I have had more than one blog in my blogging career. I don’t have a specific focus or intention for my blog right now; however, and I really want to change that willy-nilly way of posting. 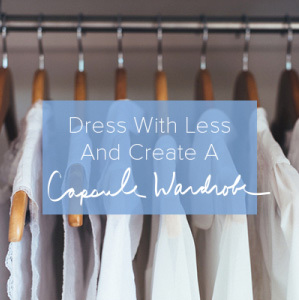 Right now, I’m blogging about simplifying and decluttering my home. What I really want to learn to do is write more effective blog posts to enhance my gorgeous photographs. Or here’s an idea: just post photos on my blog and leave the writing alone. Nope, probably won’t work for me. I enjoy writing too much I just keep thinking there are other photography bloggers out there who have already been there, done that. I realize I’m not being true to myself. Back on topic: I can do this and I will read your courses like a menu at my favorite restaurant. I enjoy your blog posts and am a subscriber and a Facebook fan.